How to Start a Blog (A Step By Step Guide) | Passive Income M.D. Let’s start with the WHY? It can be really gratifying. Whether you think so or not, people can learn from your experiences. I truly believe everyone out there has something to offer and it feels really good to hear that people appreciate what you’re posting. You’re contributing some good to the world. You have an expertise and people need to learn from you. What better way than to put it where people can access the information from wherever and whenever they want. You meet some great people. Yeah, sounds crazy I know. But now being on the other side, I’ve met some great people through this process – both bloggers & readers. The blogging world is extremely collaborative. It’s similar to being part of a Facebook group or forum, but you can learn, have fun and make money all at the same time from it. (see next point). It can be a profitable business. There now I have your attention. Maybe I should have started with this. Starting a blog as a creative outlet is great, but honestly, we’re all busy professionals. We want to maximize our time, so taking on another project purely for fun may not be worth it. However, if living your life and writing about it can bring in some extra money, why not do it? The internet is the Wild Wild West of entrepreneurship and there is an opportunity for everyone to make extra money online. Do I Need a Super Specific Niche? People worry so much about finding that niche. 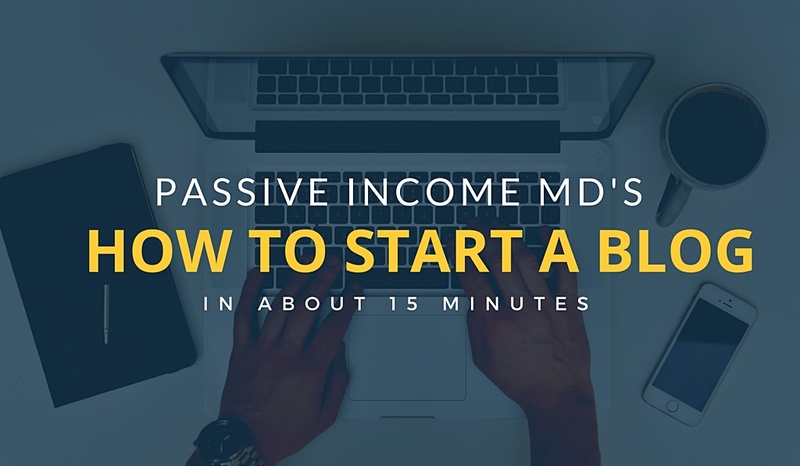 I thought so much about it when I started Passive Income M.D. but I’m less convinced it’s about staying rigid in that niche. I think it’s more about just being you and you’ll be surprised how many similar people are out there. It seems like the most successful bloggers literally just talk about what they’re doing in their own lives to achieve whatever goal they’ve set. There’s so much improvement that I can make in this area and I’m working on it daily. Okay, now that you’ve decided to jump in with me headfirst, here’s my 15-20 minute quick and easy guide to starting a blog. Free Service – like Blogspot, Webs.com, Squarespace. You can start with one of the free offerings, but trust me, if you’re serious at all you will outgrow it and end up paying big bucks to upgrade. Plus, with the free service you also cannot link your own domain name so it’s going to be a name like myblog.blogspost.com and most of the time if you attached a real domain, you’d have to bring all your readers over. However, it is an option if you want to just play around. 1) Click here to go to Bluehost.com. 2) Click “Get Started Now”. It’s even cheaper now than when I first signed up. Pick the plan that makes the most sense. I’m always about a bargain, so I’d pick the middle of the line one (plus), huge upside for $2 extra. Ultimately though, you can’t go wrong with either. 4) Pick your domain name. This one takes a little thought but don’t overthink it. It’s not like naming your child so just pick something that describes you and your interest. Whatever your website name is, I’ve found that people will find and stick with you for your content. Case in point: Mr. Money Moustache, Financial Samurai, and Mashable. Use this handy dandy domain checker to see if a name is available. 5) Enter your account info and pick upgrades. The only thing I did was the Domain Privacy Protection so people can’t look you up readily. Small price to pay ($.99/month) for a huge amount of privacy. 6) Boom, now you just have to pick a password and log back in. You should be receiving an email detailing your login info. 7) Okay, now you’re ready to build the site. This is where I was worried I’d get left behind but if you follow these steps you’ll be in good shape. 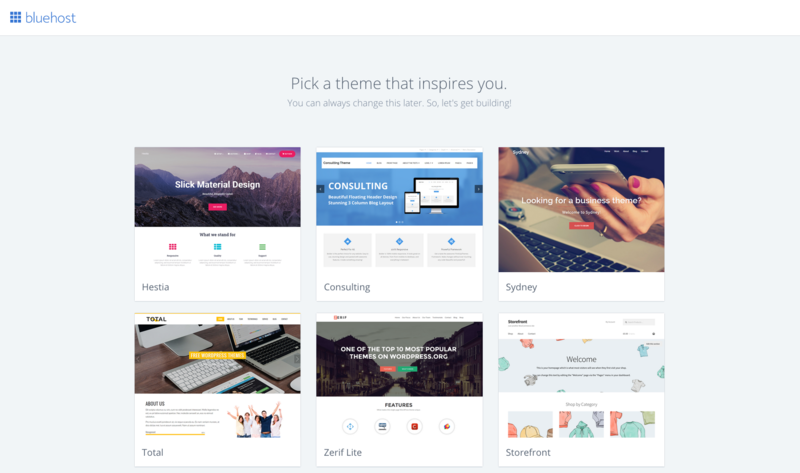 First thing you’ll be prompted to do is pick a nice theme. They make the page easier to build while making it look professional and nice. 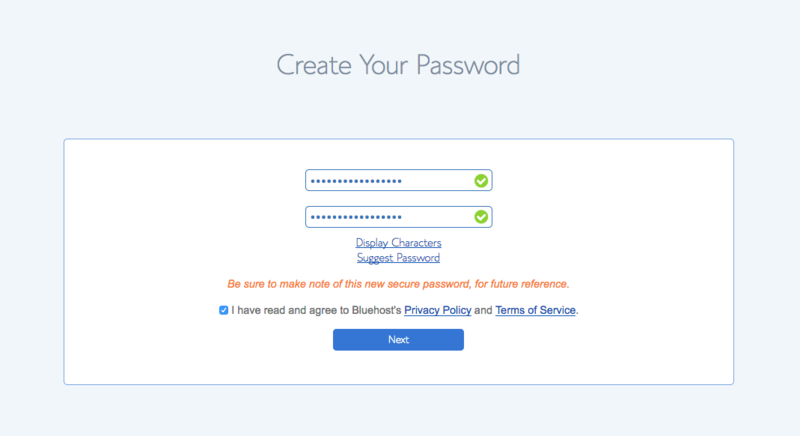 You can always change these, but bluehost provides some great ones to get your started. 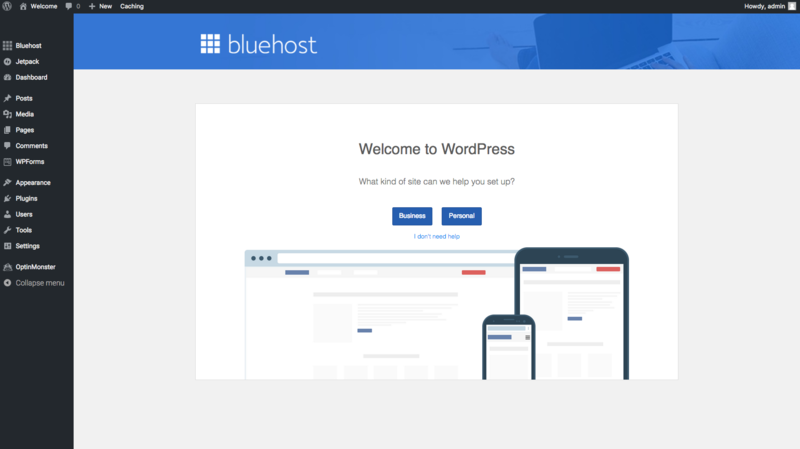 Once you decide on a theme, Bluehost makes it incredibly easy to get started with WordPress by automatically connecting you with the click of a button. Before you continue, don’t forget to check your email to activate your domain name. Now you’ll click on the Blue “Start Building” button. This will complete the wordpress installation process and take you over to your site’s WordPress dashboard. Easy to install and off you go. That is literally the entire process! 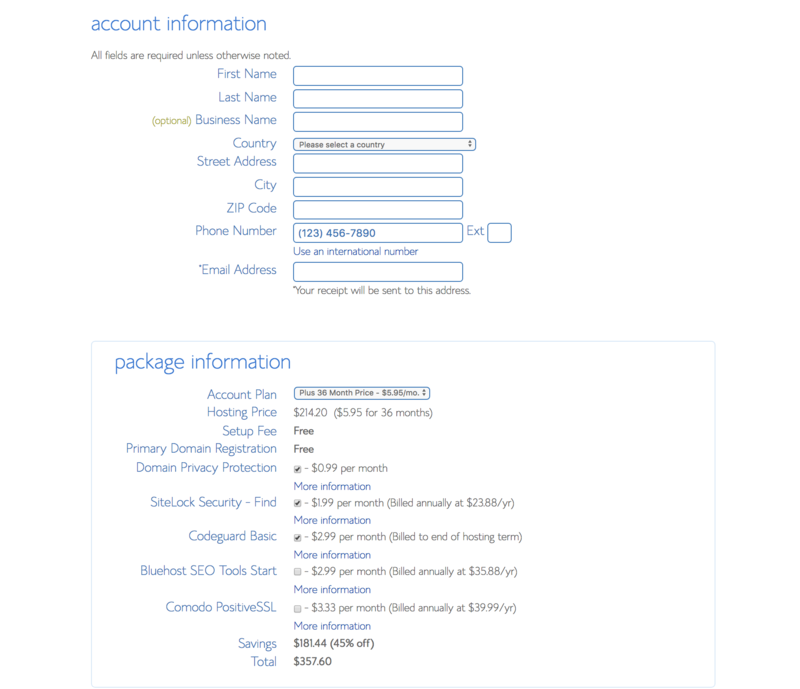 If you have any questions, Bluehost also has amazing customer service that’s available to you 24/7. Don’t hesitate to reach out if you have any questions. Let me know if you’ve decided to start your own, I’d love to talk to you about it. I’ve had so many people help me already, I’ve been doing my best to pay it forward. And if you’re ready to start making money with your new blog, you can read about some ways to start earning here. Good luck! Thanks so much for this post! I love writing and have been talking about starting a blog almost daily for a while now! Now, it’s done! Now for theming and content! You’re welcome. Please let me know when the blog is up and running! Really nice page. I’m a hospitalist in MN going on a year long sabbatical in South America. I want to start a blog so people can follow my experience. Maybe I’ll inspire others to do something similar. Not sure if I’ll have a lot of followers outside friends and I don’t expect to make any money, just document my year and keep up a blog when I return. 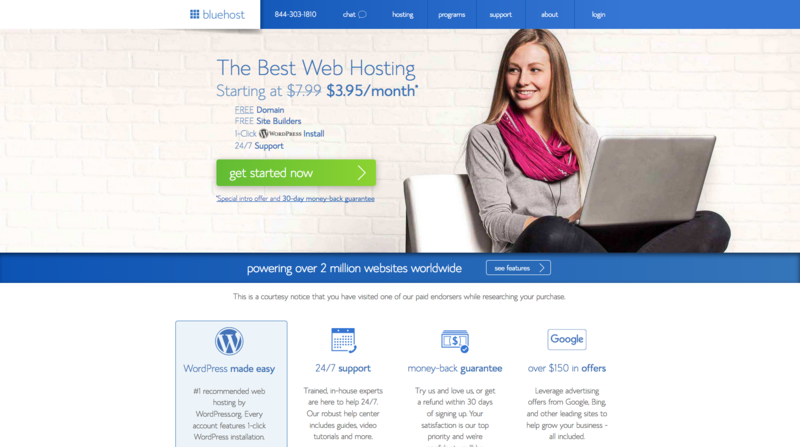 Sounds like you like bluehost as a place to start for a novice like me. I’ve read a few sites that compare the programs and costs and it all seems complicated. Can you post with your phone using an app? Is it easy to share a link? What if this blue host goes under? Am I using their programs or WordPress’s? Sounds amazing. I’m sure people would love to follow it and worst case you’ve documented an amazing year of your life. They’re all pretty similar honestly. You would be using WordPress and I suggest that’s what you go with. I changed to it midway through my first year and I regret not starting with it. You can post through the wordpress app but I find it easier to just type on your computer. Thank you for posting this! For the last couple of months, I have created a website through the wealthy affiliate program. However, I am currently a second year pathology resident and feel I need to spend more time focusing on my studies instead of building my website. So I currently find myself in a dilemma because I want to stop paying for a premium membership with Wealthy Affiliate, but this means I need to find another host for my website or back up my website somehow. What would your recommendation be? It seems like it would be possible to transfer my domain to bluehost.com. I’m actually not familiar with that company but sounds like they try to streamline everything for you. You can definitely replicate most of it on your own, as you can sign up as an affiliate directly or through some other companies that don’t charge you. So I would get it off of there unless you’re seeing tremendous returns right now. Bluehost is just one host that many people use. GoDaddy and 1&1 are others. 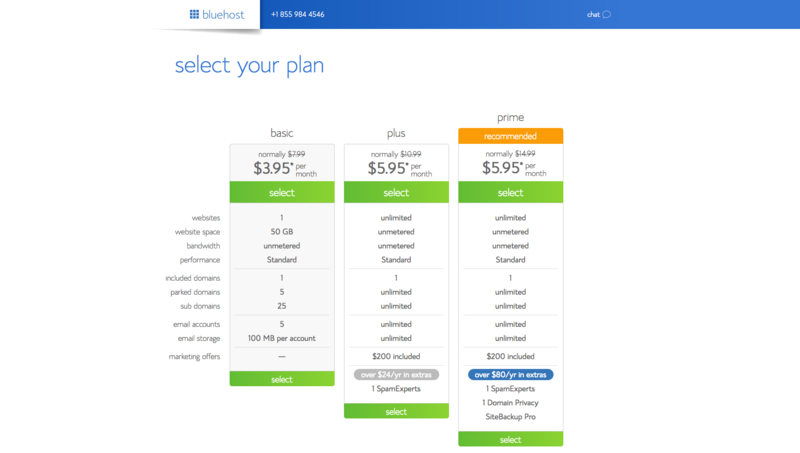 They’re all essentially the same in my opinion but bluehost has tried to make it super easy to get up and running. Your website should definitely be treated as your side hustle. Your residency takes priority but I wouldn’t say give up on the website either. The truth is, life doesn’t get less busy, there’s always something else to occupy your time (kids for example). I’m sure if you find it worth it, you’ll find the time to work on it. Great post, thanks! I’m a physician and I’ve been thinking about starting a blog specific to my field, but have been concerned about liability. What precautions do we need to take? Is a disclaimer stating “this is not medical advice, call 911 if this is an emergency, etc, etc” enough? Thanks for any thoughts! Better to do more than less as usual. Disclaimers are a must. Depending on how serious you are, you may want to consider a separate entity like an LLC as well. At the end of the day, it’s all about your risk tolerance and the type of material you’re sharing on your blog. Well thank you so much for the step by step breakdown. Like many others it is something that I thought about but never took the initiative to do until now. The cost of entry is relatively nothing so if it crashes and burns I really didn’t lose much compared to the “what if” that would plague me if I never did. Well I hope to get this up and running and having some useful content soon and will let you know when I do. Thank you for sharing this info. After reading your blog for a few months, I started mine today. You have motivated & inspired me. Happyfamilydoc.com should be up in a few hours. More blessings to you & your family! Really it is very helpful blog.thank you for sharing.